Be-Barefoot: How sick is your home? How sick is your home? Nobody wants environmental hazards such as toxic-waste dumps or smokestacks bellowing gritty plumes in their backyards. But the same sort of pollutants that come from these sites could be lurking right in your own home. Indeed it can be teeming with allergens, such as dust mites. Carbon Monoxide can escape from fireplaces, mold and bacteria often funnel from heating, ventilation, and cooling systems and volitale organic chemicals seep out of paint and carpets. Scientists have also found that innocuous household products, such as air freshners, can become dangerous when their fumes react with ozone and create carcinogens, such as formaldehyde. It's no wonder the Environmental Protection Agency (EPA) has deemed indoor air quality one of the top 5 environmental health risks the U.S. faces today. the agency says ndoor levels of pollutants can be 2 to 5 times...and sometimes more thatn 100 times... as high outdoor levels. "Just because outdoor air is cleaner doesn't insure that indoor air is cleaner" says William Narzaroff, professor of environmental engineering at the University of California at Berkly. 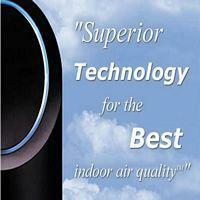 Barefoot Secret Air Purifier an affordable solution to clean air in your home!